I woke up to write this morning and discovered–to my abject horror–a fresh-brewed pot of coffee, but no milk, no creamer, nor half n half in the house. And damned if I was going to forsake my pajamas and drive out to the convenience store to get some. Better to scrounge around the house for some sort of substitute for my morning writer-fuel. Good thing my brother is something of a tea connoisseur. Better than sencha (green tea) is genmaicha (brown rice tea), green tea combined with roasted brown rice, some grains of which have popped. It tastes somewhat fuller-bodied, and less bitter than its rice-less counterpart. It is also traditionally cheaper, because the rice acted as filler. It certainly wakes you up (green teas are high in caffeine), though you have to be careful drinking any green teas in the morning–the minimal oxidation processing that gives it its robust flavor can also induce nausea on an empty stomach, so be sure to eat something first. I prefer plain white rice in the morning, though I don’t know any local farms where I could get eggs suited for eating raw atop it, as I did in Ohio. 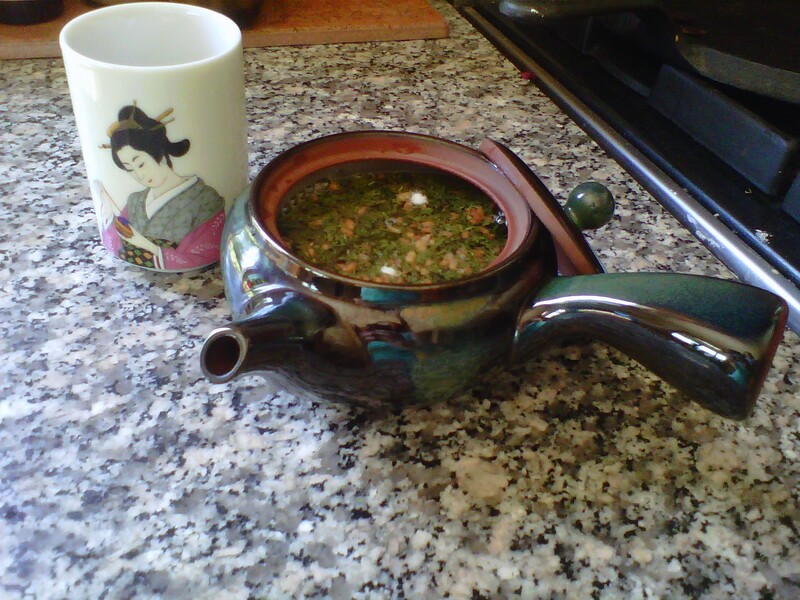 As with all Japanese teas, the trick when brewing is to allow the boiled water to cool for two to three minutes. We have an earthenware kyusu teapot that comes with a built-in filter for loose teas, though you could just as easily brew the tea loose in a cup or place a strainer (though not too tight, or the tea won’t steep properly!) in your traditional Western tea pot. Allow it to become a bright yellow-green, and pour, traditionally into yunomi, those adorable little teacups you’ve probably seen going for heinous prices at Japanese department stores. As with most things Japanese, there are wildly expensive versions of just about anything (including ohashi, chopsticks), though with a bit of google-fu you can find more affordable products for us peasants. Genmaicha is almost assuredly sold at your local Asian grocer, though much of what you find online is going to be higher-quality items. Depending on the variety, it may become slightly harder to find in the coming months, given the destruction of the latest tea crop in Kanagawa, Ibaraki and Chiba prefectures due to radiation levels. But everything you’ll find on the shelves now is all from before the March 11th tragedy, so please don’t let that scare you. What I love about brown rice tea is how much lighter, brisker, and more refreshing it is compared to the jet-black coffee with rich creamers I usually sip while writing. It’s certainly a more summery drink (though in Japan I think it’s considered more wintry), one that is like to become a habit for me. Perhaps the most important part of these little habits is that, in the same way that lighting incense before prayer gets me in the right (altared, one might even say) mindset, performing a pre-writing ritual can help overcome the initial blockages at come with a blank screen. Go through your email, social media, forum posts and blogroll first thing, so it’s no longer a distraction. Brew the tea in the meanwhile. Then, when you finally open up your word processor of choice, breathe in the aroma and enjoy the first sip. Bang those keys. And demolish that daily wordcount. Et tu, dear writers? What is your beverage of choice when sitting down at the keyboard? Is coffee still the almighty, or does it depend on the season? Being a code monkey, I like a banana and a can of standard Coca Cola (known locally as rocket fuel). Although British, I’ve never liked the taste of tea. If I am writing a blog entry or something for an RPG, I drink that for the hot-rush of the first draft and then blackcurrant and apple squash for the re-read throughs.